Curator's Statement: Photography has endured an interesting history, first being connected to science, then struggling to be recognized as a fine art discipline. Now, with the arrival of the digital age, the concept of what a photograph is or can be is changing once again. Throughout its evolution, the medium's natural fluidity has allowed for its ideological boundaries to be challenged and redefined. f/1.4 features three local artists who explore the landscape of contemporary photography in very diverse creative and technical manners to ask much wider societal questions. The narratives presented in each body of work invite viewers to re-evaluate their understanding of the meaning and function of the world around us. Together these artists communicate the nature of the photographic – focusing on the making of the image, rather than the taking of a photograph. 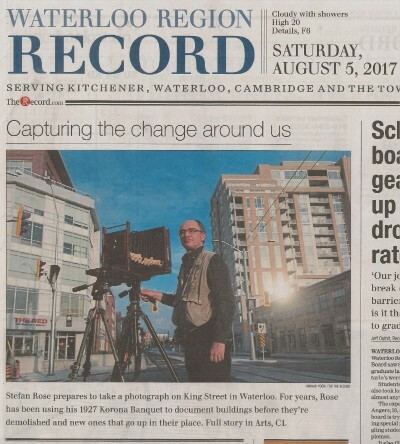 Artist's Statement - Darin White: I try to keep my feet on the streets of Waterloo Region. I try to pay close attention. Slow attention. My friend Stefan Rose called it “sustained attention.” And I photograph what I see to better understand the world. Of particular interest are the in-between shots when I’m traveling to or coming from somewhere. The world presents these surreal images rooted in the ordinary. I think of them as my B-sides. My misfits. And to me they are terribly interesting. Artist's Statement - Stefan A. Rose: My black-and-white photographic work is informed by an interest in vernacular architecture, constructed identity and the shaping of rural and urban environments. I use a large-format 8 x 20 inch panoramic view camera because the film’s extreme detail and smooth tonal gradations offer a sensuous expansive visual experience. Twin Cities is a long-term view of dramatic changes to Kitchener-Waterloo’s built landscape as industry departs the inner core and century homes also fall under the wrecking ball and high-tech workers’ condominiums replace them. In this exhibition there are fifteen prints - three prints each of five sites. Artist's Statement - Stephen Orlando: Capturing the visualization of light and sound are key elements to the development of my photographic body of work. Working in collaboration with paddlers and rowers, I attempt to visually narrate the graceful harmonic movements associated with their sport. LED lights attached directly to the paddles and oars, combined with long exposure times allow for an intriguing perspective on the concepts of space and time. Lift is a community outreach program which highlights the creative talents of artists from the Region of Waterloo. Works are exhibited on floors 4-6 of Laurier’s Waterloo campus Library. Darin White studied fine art and computer science, graduating from the University of Guelph. He grew up on the shore of Lake Huron in Point Edward, Ontario and comes from a family of very keen photographers. As a twenty-year resident of Waterloo, White has contributed to the community through efforts in the maker movement and local creative ecosystem by documenting those domains in a photo-journalistic approach on his blog, makebright.com. White is slightly uncomfortable with the term “artist” and self-identifies as a maker, often designing and fabricating his own gear to support his photographic pursuits. Stephen Orlando is a photographer and aerodynamics engineer in Waterloo. He combines his love of paddling and the outdoors with his technical knowledge to create intriguing photographs that tell the story of movement. All of Stephen’s photos are single exposures. Stephen’s work has been exhibited in Italy, Korea, Taiwan, and Canada.